Both Solid Mastermind and Solid DNA have the goal to educate the Solid Edge and the CAD community about Solid Edge, the NO MORE best keep secret of the CAD industry. 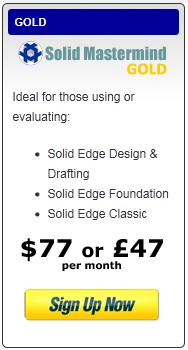 Solid Edge ST4 launch is the perfect time for all of you who have the desire to perfect your skills with Solid Edge to engage in a training experience that will help you get the most out of Solid Edge. Solid Edge users who attend the ST4 event and combine both trainnig offer, will recieved a one two additional months gift. Register for Solid Mastermind training using one of the links in this page. *Purchase or be a member for Four Three months subscription of Solid Mastermind and take one subscription of the Solid Edge Virtual Training and Solid DNA will pay and additonal one TWO month subsription to Solid Mastermind. 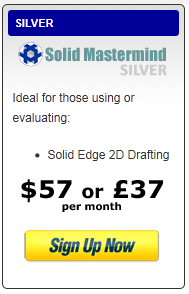 Combine with the one month offer by Solid Mastermind for those who attend the ST4 event and the one TWO months paid by Solid DNA, you will have a six months acces to Solid Mastermind traning plenty of time to get more proefficient With Solid Edge.